You can find more product videos and reviews here. Cheyenne SensiDrive® technology, motor drive through different algorithms, extremely low vibration and reduced heat generation, coupled with a powerful motor – Discover the Cheyenne SOL Terra. A revolutionary tattoo machine that guarantees clear results and reduces pain during use. The SOL Terra is a work horse, allowing me to go full on with colouring and saturation, but still a gentle giant. The power stroke reminds me of the bigger systems as the SOL Nova and HAWK Thunder, but with the option of a softer impact. The SensiDrive® gives me a nice alternative if I’m working on skin types that could be more sensitive or areas where I need to be a bit more careful. The strength and stoke is very similar to the HAWK Thunder. Without the sensi drive, like the old HAWK Thunder it’s very suitable for one pass color packing and Black & Grey work. But with the SensiDrive® on, any round liners/shaders or ways of tattooing that causes higher skin damage is resolved by SOL Terra. Now also with low speed support plus the sensi drive adjustment artists can use any viscosity of inks and get the maximum results. This makes SOL Terra the all-around machine to work with. I've been testing out the SOL Terra and SOL Luna, Both of these machines make layering the skin tones a breeze. I love being able to switch between the two different techniques. I think these are my favorite machines I've used in my 19+ years of tattooing so I think everyone else will enjoy them as well! The Cheyenne SOL Terra sets a new standard for angled tattoo machines: An unparalleled new work experience awaits you thanks to the innovative SensiDrive® technology! This new revolutionary and by Cheyenne patented technology offers two diffrent settings: “Hard” and “Sensi”. The electronics of the motor are set diffrently. Experience two completly diffrent feels. Some artists describe the “Sensi” setting as “Just like a traditional coil machine”. Other describe the “Hard” setting as “The best liner machine ever”. The SOL Terra lets you control the motor through different settings, while the application remains powerful and gentle on the skin. The results are extremely precise tattoos, reduced pain during the tattoo, as well as a faster healing process. 4mm stroke length make the SOL Terra the leading device for saturated lines and color packing for all designs. The Cheyenne machine operates from 25 Hertz in the low-frequency range and even can be increased to up to 150 Hertz. The SOL Terra always gives you you a smooth and quiet experience with significantly lowered vibrations. Our high-tech anodization process lets you clean the tattoo machine easily and safely for a hygienic practice. 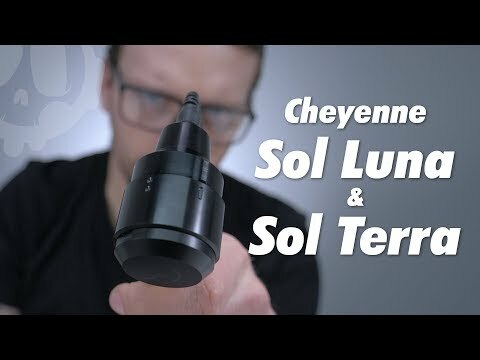 The classic Cheyenne hand piece as well as our safety- a craft needle modules complete your set-up, so you can use the SOL Terra in the best possible conditions. All Cheyenne power packs with an output power starting at 2.5 amps are compatible with the SOL Terra, for reliable control of the tattoo machine. Cheyenne SOL Terra: welcome to a new dimension of tattooing – Manufactured in Berlin. My art derives from the combination of so many styles and techniques, I need a machine which is diverse enough to help me accomplish any technique, accurately and efficiently. From fine detailed lines, to thick bold outlines, solid color packing to soft shading, dot work to brush strokes, the Cheyenne does it all. I started to work with Cheynne Tattoo Equipment 4 years ago. I figuered out, that my art derives from the combination of many different techniques, therefore I need a machine, which is flexible enough to help me accomplish any technique, accurently and efficiently. From fine detailed lines to thick bold outlines and soft shading. I started using Cheyenne in December of 2016, after I had a back spring break on one of my coils at an international convention for the second time in a month. When I got home I decided to cave in and finally try the machine that was plug-and-play, and that I heard could do it all. After two tattoos, I was pretty much hooked. A tattoo lasts forever and is should be immortal! I do not know any other modules that provide a similar level of precision and reliability as Cheyenne does. I am from Lithuania and have been living in Dublin, Ireland for over 10 years running my tattoo studio, Remis Tattoo, where I gained a reputation as the artist for bold and realistic tattoos. 2018 has been a busy year for me as I opened a second studio in Kaunas, Lithuania. I specialize in horror and realism. My style developed out of my love for horror and special effects. I am super inspired by poster style art, notably Drew Struzan and Basil Gogos. I always loved their contrast and their color palettes, and I would definitely say it translates into my work. I have a deep love for film and directing and I believe that's what sets my characters apart from other portraits. I always dedicate myself more to realistic tattoos. In the last one and a half years, I was always presenting myself in international tattoo conventions, for example in the US, in Europe and in Russia. During this time, I won 80 awards and got to know a lot of cool tattoo artists and people in the industry. In 2014, I spent all my money that I earned in my first convention and bought a HAWK Spirit in orange, which was my first Cheyenne. At the beginning, it was not easy because I do not trust new machines. But after a while, we felt in love and I just bought a HAWK Thunder for lines and dots. I don’t need anything else since then. The machine that I use the most is the HAWK PEN and Thunder paired with 3,5 shader, 7 and 15 magnum soft edge. The main reason I love Cheyenne machines is because of the superior quality and consistent. From sales to customer service the customers feel well taken care of. Innovating new ideas, makes tattooing so much easier, revolutionizing the tattoo industry. I don’t need more than one machine and it saves me a bunch of time, which is fantastic and unbelievably cool. When the Cheyenne HAWK Thunder came out in the market, it was everything I imagine a tattoo machine to be. Then the HAWK PEN came out, it was a new level on both technical and mechanical aspects, it wasn’t anything we’ve seen before. I trust this machine for every challenge and I feel very safe working with the machine. I use the Cheyenne products to tattoo as safe as possible like every tattoo artist should do. Hygiene is very important to me and Cheyenne gives me the safety and variety I need to work in so many different styles. Our tattoo needle craft cartridges: absolute safety thanks to medical standards! Cheyenne Craft Cartridges are available in the 19 most popular configurations. Thanks to the intelligent Cheyenne Cartridge System, the cartridges can be exchanged safely and quickly. These needle cartridges meet the highest standards of hygiene: They feature a special safety membrane, so no abrasive residue can find its way into the bloodstream. Be flexible – be independent – be safe with Cheyenne tattoo needle cartridges! Safety Cartridges by Cheyenne are synonymous with innovation, hygiene, and safety. These cartridges have a unique build and a patented safety membrane that set them apart from other cartridges. The elaborate sterilization process and hands-on quality inspections by experienced experts ensure hygienic and safe operation. Safety Cartridges are available in 56 different configurations. Create your own tattoo machine with our HAWK Grips! Cheyenne HAWK Grips are designed to for use with the Cheyenne HAWK Spirit and HAWK Thunder. They feature a "Click System" that enables you to regulate the needle protrusion as needed. With our HAWK Grips, you have the choice between the Standard grip (21 mm) and the more robust 1-INCH grip (25 mm). Thin, flexible, and long-lasting: Cheyenne cables are made with high-grade, sturdy materials for exceptional reliability and durability. Use these power cables to connect your Cheyenne machine to our Power Units. You can also use our adapters to attach third-party power units or to attach the original Power Units with foot switches from other manufacturers.